Have you ever wondered about the Rover buses that you see on the roads of Chester County? Who operates the Rovers . . . who are the riders? Where do the buses go, is there a schedule? I often see a Rover driver dropping off passengers at the Paoli Acme or at the Paoli Hospital, but who are the passengers, did the riders pay for the service or is it a government-sponsored program? I asked several friends but no one seemed to know much about the Rover or its operation. In my search to find out details about the Rover service, Chester County Commissioner Ryan Costello was especially helpful, as was the Director of Chester County Dept of Community Development Patrick Bokovitz and staff members Kathryn Ercole and Gene Suski, who showed an unbelievable degree of patience with my tedium of questions! With their help, I soon discovered that Rover isn’t just for trips to the doctor or to the grocery store! Started on July 1, 1984, the Rover Community Transportation is a paratransit flexible passenger service in Chester County that operates outside of the standard public transportation system. Rover is available to specific populations based on eligibility. Senior Shared Ride: Any Chester County resident aged 65 or older, is eligible to use the Senior Shared Ride Program. Based on the price of gas these days, a Rover fare of only 75 cents for ‘essential’ trips is a real bargain! The remainder of the cost is covered by the Chester County Department of Aging and State Lottery proceeds that are administered by the PA Department of Transportation. Medical Assistance Transportation Program (MATP): Residents who have active Medicaid benefits in Chester County are eligible to use MATP for non-emergency medical transportation to and from Medicaid billable medical services and treatment providers. Medicaid billable providers include both physical health services (doctor and dentist appointments and trips to and from the pharmacy) and behavioral health services (mental health and drug and alcohol treatment and counseling). The MATP program is funded by through the state Medicare budget. Persons with Disabilities Program (PwD): Any Chester County resident with a disability that is not already eligible for Senior Shared Ride or MATP may be eligible for PwD. An eligible person with a disability pays a fare of two dollars ($2.00) or 15% of the total cost of the ride (which ever is higher) each way with the remaining balance covered by the PA Department of Transportation. How many Chester County residents utilize the Rover system on a regular basis? I was told that the paratransit program is averaging just over 30,400 rides a month. In the Tredyffrin/Easttown area, the program has 157 registered riders. According to the Department of Community Development, ridership has slowly increased and the January 2012 numbers indicate an increase in usage. Although there is no data indicating why the increase, clearly the economic situation and gas prices are contributing factors. 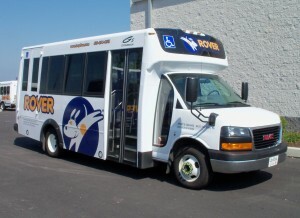 Statistics indicate that Rover had 2,450 more rides from July to December of 2011 then the same period in 2010. Delaware and Montgomery counties have similar paratransit programs and Chester County Rover works with both counties when possible to coordinate rides for people who live on the county borders. Community Transit, http://ctdelco.org/disabilities.html provides service in Delaware County and TransNet, http://suburbantransit.org provides the service in Montgomery County. With the exception of holidays, the Rover program operates Monday through Friday, with limited hours for specialized services only on Saturday and Sunday. Reservations for travel within Chester County must be made before 11 AM on the business day prior to the requested trip. To determine eligibility and/or to sign up for any of the county’s paratransit programs, you just need to contact Rover Community Transportation at 484-696-3854 or toll-free 877-873-8415. You can also get more information from their website, www.riderover.com. To use any of the Rover Community Transportation services, residents must register – and registration is free. One of the tag lines used in advertising Rover is “It’s Your Ticket to Independence!” If you are a Chester County resident and are 65 or older but still drive, you might want to take advantage of a ride with Rover, particularly when you need to go somewhere during the challenging winter months. Beyond the grocery store or the doctor, Rover can provide transportation throughout Chester County — to the shopping mall, club meetings, and the local train station or even a ride to visit a friend. However, what if your doctor’s appointment is outside of Chester County? For medical appointments beyond the county boundaries, Rover will provide travel to Philadelphia and neighboring counties. And the ride is still a bargain at only 75 cents each way – but that fare is only applicable for medical appointments outside of Chester County. All out of county rides must be scheduled at least 48 hours in advance of medical appointment. But what if you a registered Rover rider and want to go the shopping mall, to the theater or maybe the movies, can you use the county’s paratransit services for these types of “non-essential” trips? Yes, and the full fare cost is 15% of the ride. The Department of Transportation (through the PA Lottery Fund) pays for the remaining 85% of the ride. The rate is calculated on the distance of the ride – the longer the ride, the more expensive it is – however, the fare can also be reduced for group rides. Here’s an example, say an individual senior wants to go the movies four miles away, the cost would be 15% of the total cost or $1.75 each way. However, if three or more seniors were picked up from the same location and were going to the same location, say the movies four miles away, that fare would be reduced to $1.15 each way, based on the total cost of the trip. To determine the exact cost of a non-essential trip for a Senior Shared Ride, call Rover Community Transportation at 484-696-3854. For Chester County seniors who are interested in gambling, I was curious if there were plans for Rover to take riders to the Valley Forge Casino Resort (set to open this spring). The casino is located in Montgomery County (versus Chester County), so I was curious if Rover would cross the county line. For Chester County seniors interested in gambling inKing of Prussia, I have good news – if you are registered with the Senior Shared Ride program, Rover will provide rides to the casino. Rover rides to the casino will be treated just as any other non-essential Senior Shared Ride group trip where groups of seniors go to a social activity such as a play, shopping mall, the movies, etc. A ride to the Valley Forge casino would need to be scheduled prior to 11 AM the day before and must leave from one central location, such as a senior center, retirement community, or one person’s home. Riders would have to pay full fare (15% of the total cost of the ride) since a casino trip is not considered an “essential” ride and therefore not sponsored by the Department of Aging. Riders will be given the exact cost of the ride upfront when scheduling the trip. No need for Chester County seniors to go to Atlantic City to gamble – once the Valley Forge Casino Resort opens, Rover can provide transportation to the local casino. I now know that the Rover isn’t just for trips to the doctor or to the grocery store. However, you cannot participate in the Aging Shared Ride Program if you are not registered. Call Rover now to get registered, even if you have other means of transportation available to you. You never know when you may need to go somewhere and your regular transportation is not available. This article would not have been possible without the help of Chester County Commissioner Ryan Costello and the kind folks of Chester County Department of Community Development and Rover Community Transportation. I didn’t see a mention on how to schedule the return trip. Since one may not know the duration of an activity, how or when would the driver know a pick up time? I currenlty do not have a use for Rover, but I will remind some of my senior friends who might..
Libby — That would be a question to ask when scheduling Rover. It’s probably a bit of a guess, although for medical appointments you could probably do a rough calculation as to the length. Or if someone wants to go to a senior center or the grocery store, the rider probably has an idea of their visit. The Rover transportation personnel are very kind (and patient) and can probably answer those questions. with more people on some form of public assistance it stands to reason ridership will go up. In my experience, Rover reliability has failed, in the past six months, as far as providing reliable service. Who at Rover can be contacted to fix this problem, or is Rover not concerned? If rover takes you to doctor do they wait or come back?